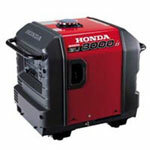 This impressive generator provides 3000 watts of power and weighs only 134lbs. and it will run for up to 20 hours on a single tank of gas when used with the Eco-Throttle feature. To prevent any possible damage to the unit, the Oil Alert will shut the unit off when the oil drops below a safe operating level. The unit also has a DC terminal for use when charging 12-volt automotive type batteries. 25.8" x 18.9" x 22.4"